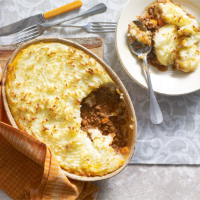 Try adding a handful of grated Cheddar into the mash and use a fork to ‘fluff up’ the mash for a really crispy topping. 1. Preheat the oven to 200°C, gas mark 6. Fry the carrots and onions in a large pan until they’re soft and starting to go golden. Transfer to a plate and fry the mince in batches for about 5 minutes until browned. Return the mince, carrots and onions to the pan and add the tomato purée, Worcestershire sauce and stock, cover and simmer for 20 minutes. This freezes well. Make two smaller cottage pies but don’t bake – instead allow to cool completely, cover and wrap well in clingfilm or place inside resealable boxes or bags; label, remembering to date it, too. Freeze for up to one month. To reheat, thaw overnight in the fridge; place in a preheated oven at 200ºC, gas mark 6, for 20–25 minutes until piping hot.